Thanks in advance for taking time to fill out the survey! Knowing your interests helps me to know what content to focus on. Well, I'm not promising that I'll necessarily change a lot based on your responses because "my blog, my rules" (ha!) but I definitely want to get a feel for what you all value as readers. Okay, enough with the exposition. Goals! Let's recap. Post at least once a week. I posted six times, so I finally hit my goal for posting during the month! Pitch a freelance article. I did this, and I even submitted a draft for the guest article! Cross your fingers - hopefully I'll have good news and a link to share with you all soon! Figure out how to take pretty photos with Christmas lights. I played around with this a little bit but I got distracted by other shiny holiday things, sorry. Make it through my 40 day running streak. I was doing so well with this until I busted my Achilles tendon and was forced to take a break. The tendinitis is doing better; I've had ups and downs during the recovery (mostly involving me getting excited about having less pain and going out and hiking for 11 miles or climbing or running 6 miles or something), but I'm getting closer to fully recovered. Plan spring race calendar. Well, as expected I didn't actually sign up for spring races, but I've penciled in a bunch of races for next year. Exciting! Climb at least once a week. I climbed nine times in December! That might be a record for me in a month. Explore South Mountain and Doughton Park. Correction: I'm an idiot and I meant Stone Mountain instead of South Mountain, but ah well. I didn't make it out to Doughton Park, but I explored part of Stone Mountain state park. It wasn't actually a public trail though: the cabin we stayed at backed up right to park lands and we hiked a trail from the cabin straight up the mountain. It was snowy and icy so we had plenty of fun exploring around our cabin instead of driving out to the area parks, but I'm hoping to go back and explore some more in 2018. Finalize spring trip plans. I'm still figuring out the last few details, but I did the important bookings at least. Read two books. I actually read four books in December! Three of them were audiobooks (The Book Thief* by Markus Zusak, Lincoln in the Bardo* by George Saunders, and Uglies* by Scott Westerfeld) and kept me stimulated while baking holiday treats, wrapping presents, traveling, and then cleaning up the aftermath of the holidays, but I read one book (A Walk for Sunshine* by Jeff Alt) over the weekend we spent at the cabin. Seriously, is there anything better than hiking in the mountains and coming back to a cozy cabin and curling up in front of the fire with a good book with your dog and significant other? I firmly assert no, no there's not anything better. Survive the holidays. Hooray! I'm alive, you're alive, we survived the holidays! Go us! I set the bar pretty low for December knowing it would be crazy with the holidays, but I was pretty darn successful with those goals if I do say so myself. Now we've got a whole new year to set goals and see how we grow! For my yearly goals I updated the categories by splitting out the fitness activities. Previously I just had a "Running/Fitness" category but I want to make sure I stay focused on hiking/backpacking trips and that I'm improving with climbing, so I'm splitting up the categories for monthly goals to include "Running," "Hiking/Backpacking," "Climbing" and "Other Fitness." Type up 15 pages of fiction writing. My goal is to write my first draft of my first novel this year, so I've got to make sure I set aside time for this and make it a priority. No excuses! Catch up on some photo editing. Lots of photos need to get out the door soon, so that's my goal for January! Get past my Achilles tendon injury. I'm still kinda taken aback that I'm injured. In terms of actual injuries I've been lucky and avoided most injuries that affect my running (Well, except for the frequent skinned knees or the occasional concussion from soccer, ha! ), so being sidelined by an injury has me all discombobulated. It's been hard for me to not immediately jump into activities again as soon as I feel able, so I've been trying to take it easy, do what I can, and don't push my limits too much. Go on at least two "Sunday Stroll" hikes. It's a bit cold for a backpacking trip right now (I need a bit warmer sleeping bag - anyone got a few extra hundred bucks for a fancy zero degree one? ha) so I'm going to try to knock out some local, easier hikes. Do another Mountains-to-Sea Trail hike. More on this later! Climb at least once a week. Hooray climbing! Try out a new yoga studio. Remember how I promised myself I'd get back into yoga in 2017? Well, I promised that again in 2018, and based on how 2017 ended (just on the brink of being overwhelmed), my word for 2018 ("breathe"), and my Achilles injury (probably indicative of my loss of flexibility) I think it's imperative I add yoga and meditation back to my routine. To ease back into it I'm going to try at least one yoga studio a month until I find one I like. Start setting aside potential dates for travel in 2018. I'm being overly-ambitious about traveling in 2018, but I want to set aside time to make sure I commit to big trips. Read two books! I'm well on my way so I just need to stay on track. I hope you're all staying warm despite the cold weather! 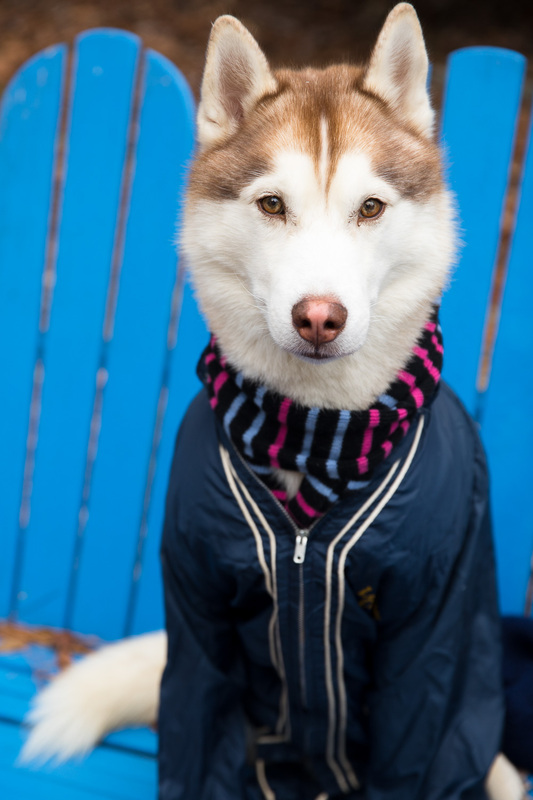 I wrapped Ryder up in some silly clothes for photos - a jacket, scarf, and I even got him to tolerate a beret - though he wasn't exactly happy about it. Ah well, the things we do for love. And treats. Lots of treats. What about you? Do you have any goals for January 2018? Let me know in the comments!